SUV owners love their Ford Escapes for the comfortable, spacious interiors they provide. The new models have some new amenity options. See why the Escape remains a top-selling SUV by stopping by our Ford sales location. 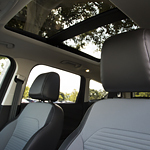 Perhaps your ideal Escape boasts a panoramic sunroof. The feature is long enough to provide an overhead view and sunlight for all vehicle passengers. The front portion of the panel tilts upward or opens completely with a push of the button. The rear of the sunroof remains in a fixed position. Choose a model with a sportier look. The sports package features 19-inch, black, painted wheels. The bezels around the headlights and tail lights are black. The front grille, lower fascia and roof rails are also black. The gear shift, seats and steering wheel also feature leather-trimming. Visit our local Ford dealership and treat yourself to a test drive.